Sekawati Bags and Aprons, A highly acclaimed name - Sekawati, specializes in the manufacturing and export of a wide variety of Canvas Bags, Cotton Canvas Bags and aprons for various domestic and business requirements. Incorporated in 1991, company offers a wide range of canvas shopping bags, cotton canvas bags, canvas bags wholesale and aprons in exclusive designs and styles that are in sync with the fashion trends and follows a professional approach in designing, production and supplying. We manufacture eco-friendly bags in cotton, canvas that are customized to meet the requirements of our clients. Our product design team ensures to consult with client in order to develop products that exactly match client's specification. We are based in Jaipur (Rajasthan), India with sophisticated manufacturing facilities that are manned by experienced and skilled personnel. Our production capacity is 10,000 bags per day, which fulfill our requirements for huge quantities that we turn out for exports and domestic market requirements. The unit is equipped with latest technology machines for stitching, embroidery, finishing and other related works. There has been a constant investment on the upgradation and maintenance of facilities so that the quality of work does not get affected due to lack for facilities. 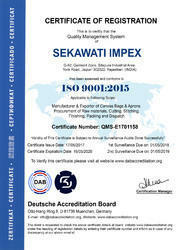 An ISO 9001:2015 & sedex certify company. Being a responsible organization, we accept our duties towards the society and environment. We are committed to offer eco-friendly products that are reusable, recyclable and does not harm the ecology. Our bags are made of cotton utilizing environment friendly manufacturing processes. These products are a viable option against plastic bags. We, at Sekawati, understand the importance of innovation and creativity in todays' fast changing world. We not only try to match with the current trends but also to introduce new patterns with our innovative and fresh designs. The company also specializes in fabricating bags in accordance with customer specifications and requirements. We take pride in having a wide customer base that include supermarkets, departmental stores, promotional organizations, silk screen printers, eco-friendly organizations and packaging professionals. Most of our clients are satisfied from our products and services and they rely on us for their various requirements of bags and aprons. Our products enjoy a good reputation in the challenging and quality conscious international market. Specially designed to satisfy the most demanding buyers the world across, these canvas bags are available in a multitude of colors, designs, styles and patterns and serve many purposes and requirements. Use of quality fabric and material ensure strength and durability. We accept orders in bulk as well as economic order quantities and as a rule the quality of products and services always remains the same irrespective of the specification or quantity desired.